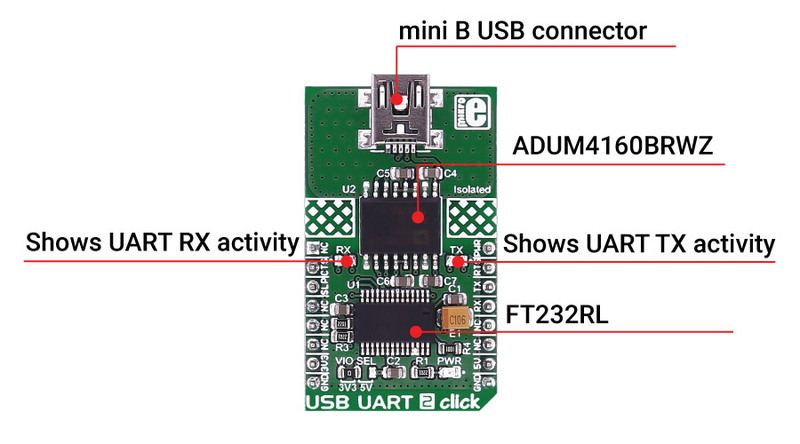 USB UART 2 click provides USB isolation and carries the ADUM4160BRWZ USB port isolator. The click is designed to run on either 3.3V or 5V power supply. It communicates with the target microcontroller over UART interface, with additional functionality provided the following pins on the mikroBUS™ line: RST, CS, PWM, INT. Use the USB UART 2 click for isolating USB communication, and preventing voltage spikes from destroying sensitive equipment. ADUM4160BRWZ is a USB port isolator, based on Analog Devices, Inc., iCoupler® technology. Combining high-speed CMOS and monolithic air core transformer technology, these isolation components provide outstanding performance characteristics and are easily integrated with low and full speed USB-compatible peripheral devices. The ADUM4160BRWZ uses the edge detection based iCoupler technology in conjunction with internal logic to implement a transparent, easily configured, upstream facing port isolator. Isolating an upstream facing port provides several advantages in simplicity, power management, and robust operation. The click takes power both from the development system and from the USB, so both sides of the isolator can function. The FT232RL chip on board to act as a USB-UART converter. Applications USB peripheral isolation, isolated USB hub, etc.